The boy was nine years old and excited . . . it was finally his turn; he had been waiting for this opportunity for a very long time. Wearing the uniform of a hunter, the boyreported for duty that morning, tucking himself inside of a blind with his face painted black as night. There he waited patiently next to his father in the back corner of the land they had just bought and it was there that the sun would make its way to the ground as the light of daydistanced itself from the cool, evening breeze. The time they would spend together than night would be done so in stillness; the boy committed to himself that he wouldn’t move a muscle, not so much as a single twitch, until he found his prey. At 9 years old, it was said that he could rarely stop moving. Some would even say that he had difficulty with maintaining his attention, but for that time during that one particular evening he was fixated on everypeeping sound and on every single solitary movement. In fact, at the point in time that he heard the first of thecrunching leaves, he was in the middle of trying to discern the sound of a squirrel from that of a rabbit. His father heard the crunching noise as well and was proud of his boy as the little squirt showed his ability to detect thesounds that his dad had worked so diligently to teach him to listen for. The small doe made her way into view and stopped 10 yards short of the deer blind to chew aseemingly innocent blade of grass. The father knew that there were two, possibly three more deer right behind the small one in the brush separating the woods from the meadow, but this was his son’s moment, not his, and he wanted to see how he would handle it. The little boy felt the rush of adrenaline coursing through his veins like lightning streaking through a copper wire. It felt good . . . really good. He buried his right eye into the ocular of the scope and fixated his crosshairs on the kill zone just as his watchful father had taught him. He took a deep breath as his finger applied a slight pressure to the trigger of his crossbow . . . and then he removed his finger from the trigger just as slowly. He pulled himself away from the weapon and whispered to his father that this was only the first day of the youth hunt and that while there would be plenty of little does, he was after a bigger deer. His dad nodded and patted his son on the back, not failing to hide his glimmering pride. It was then that the other three animals crossed paths with the child’s peripheral vision. 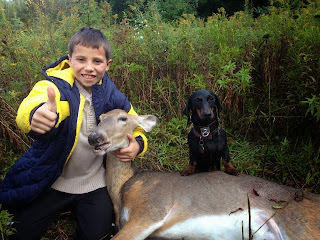 In very quiet fashion, the kid turned his weapon towardthe largest of the three deer. As she turned broadside, he pulled the trigger, burying the arrow in her chest cavity. Father and son took a few minutes to reflect upon the shot that just seconds before burned itself into both of their memories forever. “My son just got his first deer,” was a thought that would live in infamy for the man and one that would never be forgotten. After a few congratulations and about 10 minutes of conversation about ‘the shot’, to would venture outside the blind to begin the secondary part of the mission, retrieving the kill. Pacing around the site of where the deer last stood, the father became slightly nervous, not finding a single drop of blood within about 15 yards of where they saw the arrow pierce the body of the deer. Then, looking at his feet, he found the arrow. Upon examination, it was apparent that the arrow had somehow made its way into the gut of the beast and it was at that time that fatherhood realized his mistake. He attempted sons shoulder indicating that it was time to fire the weapon, however perfect broadside shot, while perfect to him, would have been slightly imperfect to the angle of the son who was positioned approximately 2 feet to the right. It was at that time that he took a moment to educate his son about that shot deer, explaining to him that it would be best to wait until the morning to track the animal such that they did not jump her out of the spot that she was likely already lying at to die. Knowing his own poor track record with retrieving gut shot deer and realizing that he would do anything on earth to retrieve his son’s first kill, he contacted his friend, a much more seasoned hunter, to ask for help. The friend explained that he would call in a favor to another friend who just so happened to be in the business of tracking difficult to find deer. The father and the deer tracker communicated with one another at night, agreeing to meet up in the morning to commence the search. Father and son woke at dawn and after an hour or so of conversation over breakfast about the excitement that transpired the evening before, they made their way out to the back of the property where they would meet up with the deer tracker who curiously had brought with him a four-legged little friend named Cyprus. Cyprus he explained, was a Dotson who had retrieved upwards of 50 deer the prior season. It was explained by the tracker that this resulted in about a 75% retrieval rate. It did not take long for the father to realize how impressive this was when taking into account the fact that almost 100% of the animals this little dog would track were much different situation than the one he was in with his son. The animals this dog was used to tracking would be those worth the price tag of the paid tracking services. Ordinarily, and everyday doe would not make it onto that list. This dog was used tracking big bucks and hunters do not give up on tracking big bucks until they have exhausted every resource possible to find it, including cases of beer as payment to groups of fellow hunters and friends. Therefore, this dog was only used to tracking in the most difficult of situations, usually gut shot bucks in which there would be only very, very, tiny blood trails or no blood trails at all. This gave the man confidence that his son’s doe would in fact be recovered. Watching the little dog go to work was a treat for the father and for the son who’s dad had let him skip school that morning in favor of cementing his first venture into manhood. It would be about a half-mile of tracking through thickets and hardwoods with a very scant blood trail until the animal would be found. The man knew shortly after commencing upon the tracking venture that there is no way he would ever have been able to recover the animal on his own without the assistance of Cyprus, a little deer tracking Dotson. 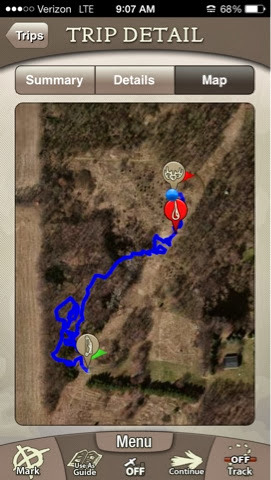 I hope you like the little story of how my son and I came to track his first brush with hunting victory. We could never have done it without Cyprus and Rob and James and I thank them both very much. It was one heck of an experience watching Rob’s friend go to work and it was absolutely worth every penny to ensure that my son retrieved that first deer of his. I cannot imagine how deflating it would be for him had we not been able to recover it. It occurred to me while we’re tracking James’ doe that if I’m lucky enough to have a truly large buck make the mistake of wandering past my arrow this hunting season, I very well may not even attempt to track it on my own if there is any doubt in my mind whatsoever that it was not a perfect shot. I figure that if I am willing to pay money to put it on a wall, I will certainly be willing to pay a few bucks more to ensure that I recover it at all before I mistakenly kick the deer out while tracking it, never to then find it at all. Couple that with the fact that watching his little dog work was worth well more in and of itself then what I paid for the tracking services and I figure you have a winning combination. In the end, Rob was a great guy and his dog was amazing. The service was fantastic and if nothing else Rob, a lot about tracking while I was walking around with him looking for the deer. That was worth it on its own. Thanks a lot Rob and I look forward to you in Cyprus helping me out again hopefully later on this year. With any luck we will be tracking something with big horns this time around. Who knows, if we are truly blessed then maybe it will be James’ deer again.